School Chaplains do great work promoting social, emotional and spiritual wellbeing in schools. We know this because every year, we hear story after story about the amazing contribution they make to the lives of students, families and staff – the people who know chaplains, work alongside them and directly benefit from their work. In this report, we are pleased to tell this recurring story in a different way – through data, graphs and infographics. The ‘Chaplaincy Activities Survey’ conducted in term 2, 2018. In this survey, we asked School Chaplains to record information from their pastoral conversations across one week and to record their involvement in programs and activities across the entire term. The sampling frame was 100% (580 chaplains) and the response rate was 67.41% (391 chaplains). 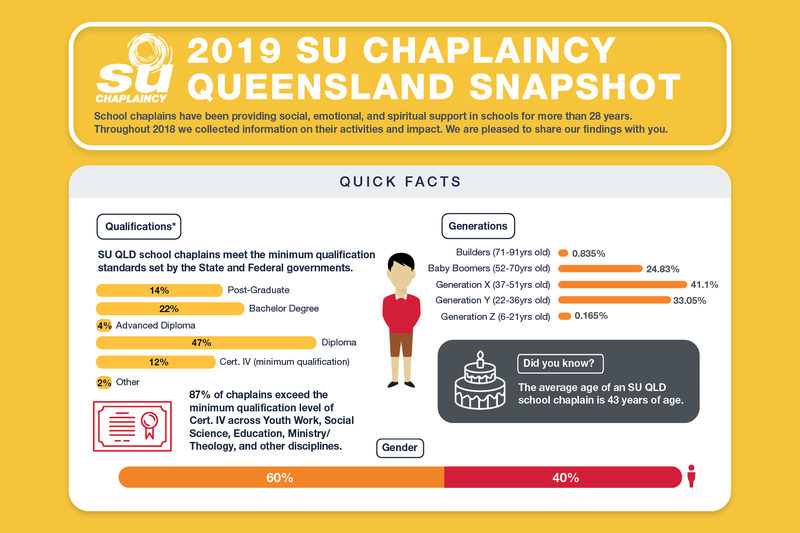 General demographic information from SU QLD chaplaincy employment data. Not all the information collected was included in this report. This report is a ‘snapshot’ of the information that, from our experience is the information people are most interested in when it comes to finding out more about school chaplaincy. 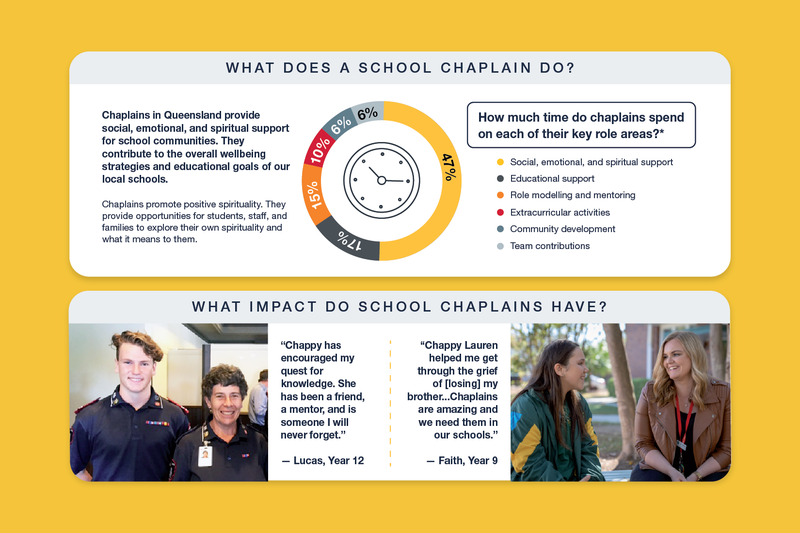 Thanks to the School Chaplains and field workers who gave their time to record data, to McCrindle who helped us put together our ‘Chaplaincy Activity Surveys’ and to SU QLD staff who crunched numbers, interpreted data and designed infographics that have helped us understand the story of school chaplaincy better than we did before. To view the full report, please download the PDF below. This information was obtained from employment data. This information was obtained from the ‘Chaplaincy Activities Survey’. Chaplains responded to the question, “What is your highest, most relevant qualification for your chaplaincy role?” In 2018, the minimum qualification for a school chaplain under the National School Chaplaincy Program (NSCP) was a Certificate IV in Youth Work, Pastoral Care or an equivalent qualification. Chaplains could be employed without these minimum qualifications under certain circumstances (eg – appointments to remote chaplaincy positions). These chaplains would still need to meet all other criteria, complete two nationally accredited units in referral and mental health and commit to ongoing study towards the minimum qualifications within three years. 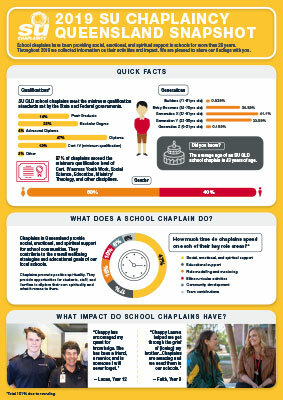 What is the impact of a school chaplain? These interviews were conducted separately to the Chaplaincy Activity Surveys.  Parental permission was given for promotional purposes at the time of the interview. Who do School Chaplains talk to? The average number of days worked by chaplains is 3.23 days, this total was rounded down to the closest whole number. The number of pastoral conversations per week had with students, staff and parents/carers were rounded from 25.19, 8.86 and 5.11 (respectively) to the nearest whole number. How do School Chaplains help students? Chaplains responded to the question, “What were the main issues for the students that had ‘formal’ pastoral conversations with this week?” to find the top 5 issues students talk to chaplains about. Chaplains responded to the questions, “How many [formal and informal] pastoral conversations have you had with students?” to find how many formal and informal conversations chaplains have with students every year. Chaplains responded to “How many times this week did you meet with the following school-based and community support staff?” and “If you undertook any off-site visits in Term 2 of this year, where were they to?” to find the number of meetings with other staff and community groups. The totals provided are PER WEEK. How do School Chaplains help students with bullying? If chaplains identified bullying as an issue they had discussed with students they were asked to categorise the forms of the alleged bullying. What does School Chaplaincy look like? 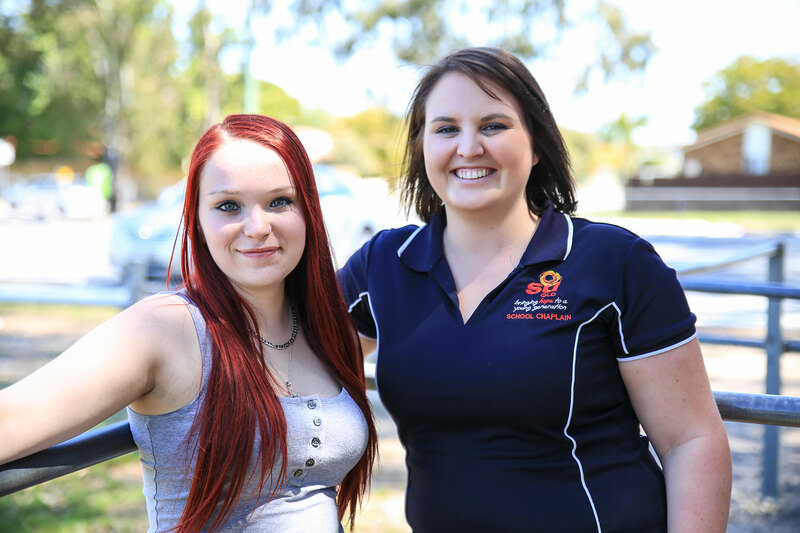 This interview was conducted separately to the Chaplaincy Activity Surveys. Parental permission was given for promotional purposes at the time of the interview for images. What other ways do School Chaplains provide support? Do School Chaplains work with those ‘at-risk’? Where are our School Chaplains? – this information was obtained from employment data.